No one doubts that running a marathon is an incredible achievement. Some react with envy of being able to run that distance. Others shake their heads and wonder at the insanity of enduring 26.2 miles, but they respect the accomplishment thanks in part to 116 years of the marathon's existence and mystique. A handful truly think the feat requires a white coat and hospitalization. (And those nominally informed about health assume the only result will be a wheel chair and numerous replacement surgeries.) This is all better than when the marathon started and people assumed runners would collapse and die at the end or that no woman could ever run that distance. Yet without much exception, the reaction from friends to me watching a marathon on TV basically borders on incredulity. Why in the world would I want to subject myself to 2+ hours of a race that is usually decided in the final 15 minutes - if it is even close at that stage? This past week, I have had the opportunity to watch two exciting and enjoyable races - the Women's and Men's Olympic Marathons from the streets of London. For the Women's race, I streamed the UK coverage a few hours after completion via the NBCOlympics.com site. (Getting up to watch live at 3 am was crazy even for me.) Today, the last day of the Olympics, I got up at 6 am to watch the Men's live (about half of which I watched from the exercise bike in my hotel's workout room). The course in London ended up being excellent. Yet on paper, a twisty city marathon built of basically 3 loops seemed just plain wrong. And the marathon, instead of finishing in the Olympic stadium as the closing ceremony begins, was run no where near the East London Olympic Village. 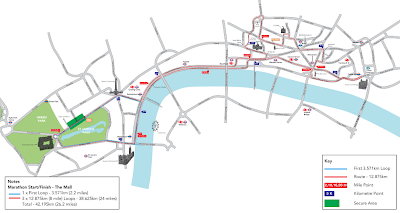 Instead it concentrated on the the landmarks of London and ended at the site of the London Marathon finish in the Mall near Buckingham Palace. But we needed have seconded guessed the LOOC. Crowds were out in full force during both marathons - the women's being mostly run in the rain while setting an Olympic Record. I think the repeating nature of the course actually helped the competitors plan their strategies. I have to say from experience that running the same route and course a few times does matter. I have found that with both the LA Marathon and the NYC Marathon - the only marathons I have run more than once. I suspect I will experience that when I run London again next April. One reason I watch marathons is to see how the best run them. The back 4 miles or so of the Olympic marathon was pretty much the same as the last 4 of the London Marathon. That was very interesting to watch because I had just run them myself. I knew that there are a few steep uphills and downhills as the embankment part ducks under bridges. In the men's marathon, the winner, Kiprotich, used one of these sections to pull away from the Kenyans who finished 2nd and 3rd. That was incredible to see. This all happened at mile 24. In the women's marathon, the top two were battling back and forth in the final few miles. Could I power up those hills late in the marathon? I will have to put that to the test. Both races included some early moves as well. The Kenyan Kiprotich, who claimed bronze, surged ahead for 10 miles. Yet he was eventually caught and passed. Was it a mistake to surge? I guess so from the result, but who knows how he was feeling. In a marathon, you have to go with it sometimes. The Russian woman in third pushed the speed too, but a pack of women stayed with her. She eventually couldn't hold with the winner from Ethiopia. What's remarkable about Gelana is that she actually fell at a drinks station. Yet she got back up and got into the race again and then won by a few seconds. The marathon is forgiving in that manner. It is not forgiving if you are not feeling up to par. 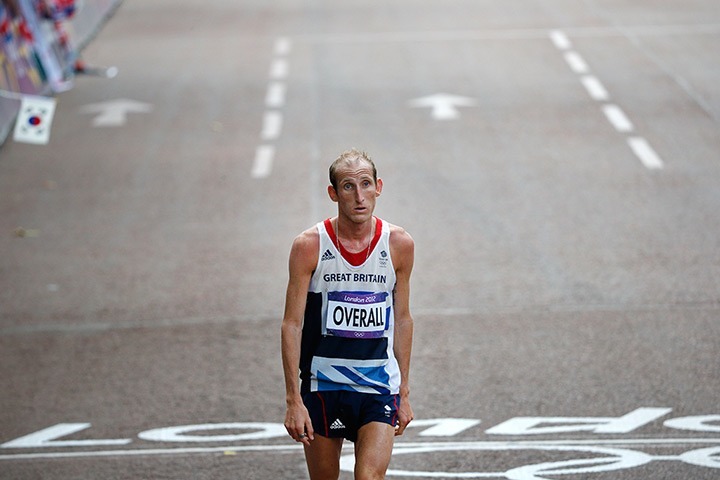 The top American runner, Ryan Hall, looked lousy from the start and eventually dropped out. Interviewed by Lewis Johnson from NBC just afterward, Ryan said his hamstring never felt great. He tried to work it out during the race, but ultimately it beat him. I suspect Ryan could have finished the race in a slow time (for him), but that's not what this event is about. 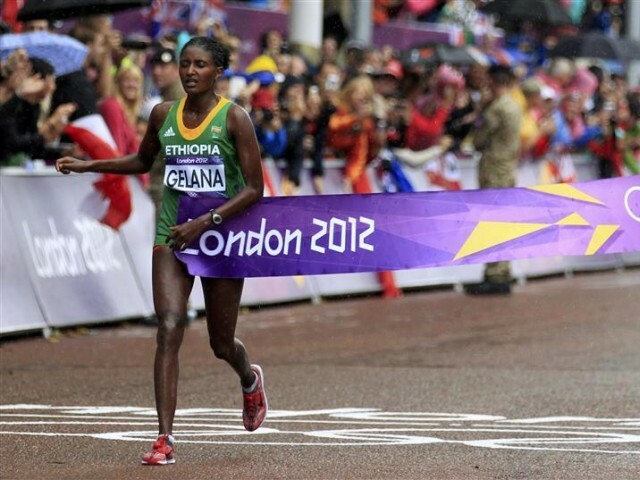 This disappointment follows Deena Kastor, the American female record holder, breaking her foot early in the 2008 Beijing Olympics Marathon. Most surprising and exciting for me was seeing Meb Keflezigi move up from way back to 4th. Meb was a silver medalist at the 2004 Athens Games, and the 37 year old has been battling injuries. He won the NYC marathon a few years ago in a surprise 2:09:15 (his PR), and to catch Don Santos from Brazil (who ended up 5th) in the last mile was awesome. I wish the TV coverage had shown more of this. Meb was born in Eritrea and moved to the US as a refugee when he was 12. He is a wonderful personality and a great ambassador for the sport. It is easy to focus on the top runners, but over 75 runners ultimately finish the race. Due to the qualifying standards, you can find personal best times over 20 minutes slower than the top runners. 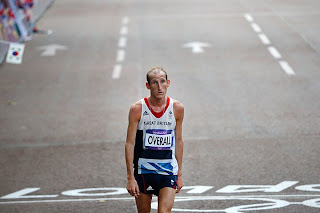 Still, finishing a marathon at any point is incredible, and for some, like Overall of britain who came in 61st, this is still their Olympic moment as anguishing as it looks. Trust me, watching the marathon was far easier than running it in sub 3 hour times. Would your cheat in a race?